Celebrating the life of Smithen Wigley, Jr.
Be the first to share your favorite memory, photo or story of Smithen. This memorial page is dedicated for family, friends and future generations to celebrate the life of their loved one. 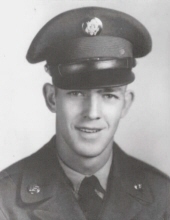 Obituary for Smithen Wigley, Jr.
Smithen Wigley, Jr., age 88, of Dawson Springs, KY passed away on Saturday, January 5, 2019 at St. Mary’s Medical Center, Evansville, IN. He was born on September 9, 1930 in West, Mississippi to the late Joseph Smithson Wigley, Sr. and Piccola Siddon. Mr. Wigley served his country in the US Army during the Korean War having served a year and five months in Korea. He was a member of the American Legion Post 310 for many years. Mr. Wigley worked and retired with the Illinois Central Railroad for 43 years, and he was a member of the International Brotherhood of Electrical Workers. Mr. Wigley was a member of the United Methodist Church in Dawson Springs, KY.
Mr. Wigley is survived by two daughters ~ Scarlet Lovins and Manya Wigley of Dawson Springs, KY and a son ~ Cole (Asha) Wigley of Dawson Springs, KY. He was survived by half sisters ~ Theresa and Memrose; three grandchildren ~ Blake Wigley, Katya Barton and Natasha Wigley, and three great-grandchildren ~ Kaylee Wigley, Madelyn Wigley and Marshall Earl. Preceding Mr.Wigley in death were his parents, his beloved wife ~ Janice Wilkey Wigley (4-28-2012), and daughter ~ Lisa Layne Wigley (6-10-2017). Visitation for Mr. Smithen Wigley, Jr. will be Tuesday, January 8, 2019 from 5:00 PM until 8:00 PM at Beshear Funeral Home, Dawson Springs, KY, and on Wednesday, January 9, 2019 from 9:00 AM until the funeral hour at 2:00 PM at Beshear Funeral Home, Dawson Springs, KY with the Rev. Donnie Howton officiating. Burial will follow at the Rosedale Cemetery with a military Honor Guard Service provided by the US Army and the Hopkins County Honor Guard. Active pallbearers include Jon Cotton, Chris Smiley, Randy Chappel, Curtis Beshear, Randy Barton and Billy Lovins. Honorary pallbearers include Ruby Poe, Gayle Purdy, Deward Stallins and David Sewell. To send flowers or a remembrance gift to the family of Smithen Wigley, Jr., please visit our Tribute Store. "Email Address" would like to share the life celebration of Smithen Wigley, Jr.. Click on the "link" to go to share a favorite memory or leave a condolence message for the family.